Here is my latest publication, a column for the leading Russian website Yezhedevny Zhurnal. It’s the first time that institution has published my writing, and the expert translator David Essel, who translated Boris Nemtsov’s review of the Putin years, has kindly agreed to translate it for me into English. It has to be admitted: the March of the Dissenters on 6 May was a failure, first and foremost because of us, the organisers. The organising committee got together once or twice and never decided anything much. After that, matters were left to take their own course and the individual member groups each did its own thing. Disastrously little money – to all intents and purposes none whatsoever – was spent on the march’s needs. Handmade National Bolshevik stickers and a few Oborona graffiti weren’t going to make a mark, and the issue of the United Citizens Front (OGF) newspaper didn’t come out in time for 6 May. Furthermore, no attempt was even made to involve other organisations, as was done previously, in the preparations for the event. The prize in the disorganisation stakes has to go to the appearance at Chistye Prudy of Denis Bilunov to announce that the event had been cancelled at the very time that activists from Oborona, Smena, the OGF, the National Democratic Union of Youth (NDSM) and the National Bolsheviks were trying to break through to the march. Bilunov did of course try to save the situation but the end result was basically an admission that we had failed. One of the really special things about the Dissenter’s March was that it was going to take place no matter what, regardless of pressure from the authorities. When its organisers voluntarily cancelled it, that could only be taken as an admission of defeat. The failure of the 6 May event was in some ways a foregone conclusion. We lost interest and drive; the enthusiasm that existed during the preparations for previous events was not there. As a result, after the well-known spring demonstrations of 2007, the number of events we held went down and down while interest in them dropped as well. The early Dissenter Marches were some of the most outstanding and most discussed political events in the country. As time has passed, however, they have become more routine sorts of events, almost like May Day Communist demonstrations. Worst of all, new people have stopped joining in. I am sorry to say this but I think that this demo-march format has lost its relevance. Each demo is going to be weaker than the preceding one until the very concept of “Dissenters’ March” becomes totally discredited. To hold them purely for the sake of getting a few fresh photos of OMON cops arresting participants is fairly pointless: there are years’ worth of such photographs on the internet already. The cops too are getting better at dealing with our demos. What we need to do now is something different – and that is to get as many people as possible involved in resistance against the authorities, help then get over their concerns and fears about doing so, and teach them how to peacefully defend themselves on the streets. For example, we could set ourselves the task of holding the largest mass meeting of recent years this autumn, perhaps in the form of a concert or festival. It does not matter much where it would be held – even Tishino will do so long as it is possible to get together somewhere. An event of this kind will need serious resources and take months of time and effort to organise. However, if we make a success of it, it will be far more useful and important than three hurriedly organised Dissenters’ Marches of a few hundred people in each. An event of this kind could be arranged under the banner of The Other Russia and perhaps even be the first ever event in support of the National Assembly. The main things is that we need to attract new people – people who did not previously join opposition demos – and show that we can do more than just present our backs to the police so that they can beat them with truncheons. It was attended by about one hundred people — twice the limit of the permit. Police threatened to arrest all those in excess of the allowed number of 50 participants. We notified the police that this is not a proper basis for arrest as there is no such provision in the criminal code. They maintained the threat but took no action. 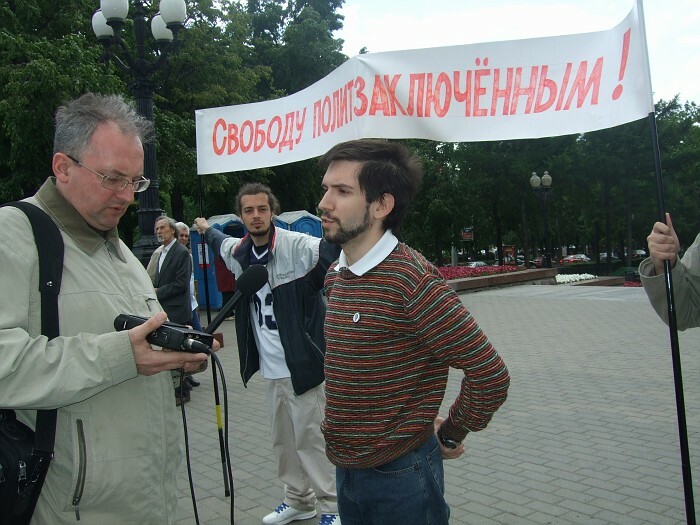 Joining in the demonstration were the leader of the movement “For Human Rights” Lev Ponomarev and journalist and poet Marietta Chudakova. Various opposition groups joined Oborona in calling for the immediate release of all political prisoners.